Some weeks I use a meal planning program to map out every night’s menu and develop a shopping list and life is easy. Other times I let spontaneity take over and I’ll buy something from the farmers market and figure out how to use it later or look in my fridge, Google a few ingredients and see what recipes come up in the search. In either case, getting to the point where I can confidently whip up something on the fly came years of knowledge stemming from a handful of cooking classics that are still on my shelf. The following are more than books – they have guided me and shaped my cooking style over the years and their recipes have become a part of the fabric of our family memories. 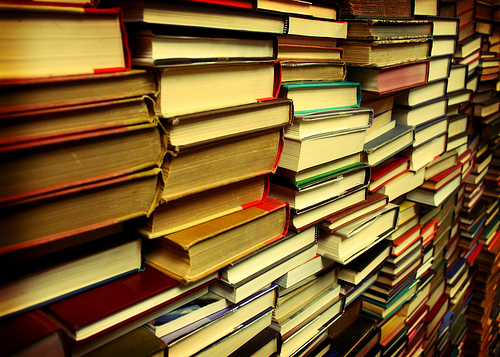 Online blogs, websites and databases are definitely a great development and some may argue that books have become obsolete, but don’t forget the well-loved classics that have helped many lifetime cooks like me. Call me old school, but inscriptions, flour and torn pages are all part of the experience and stains are like clues on a treasure map. The more you find, the better the recipe in most cases. I am constantly surprised by the breadth and depth of this all-inclusive volume. With hundreds of recipes, thorough and simple-to-understand instructions and many favorite basics, the Joy of Cooking is a must have. 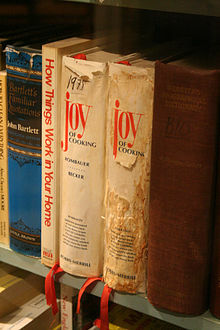 My copy is falling apart at the seams and its pages carry the stains of many haphazardly joyful cooking experiences. I’ve often thought that the only thing missing was nice photographs, so a recent series of JOC books that focus on a particular area (breakfast, soups, vegetarian, etc.) and feature full-color photography might be worth checking out. I discovered this cookbook when working at a natural foods cooperative and authors Nikki and David taught me use new and unfamiliar ingredients to build a new repertoire of favorites. Life has come full circle and I find myself referring to this cookbook again to support a whole foods lifestyle. This book was a gift from my grandmother, and the front page bears the inscription “To my dear granddaughter, hoping this book will help a bit in your ‘domestic’ interests”. Well, it did and this book is still a good reference for dishes such as basic bread, quiche, pancakes, crepes, apple crisp, soups, salad dressings and many others. The 1987 edition by Jerry Anne Di Vecchio was updated to include more low-fat recipes and this book features “how-to” photos illustrating technique for those new to a recipe or cooking in general. Unfortunately, high cholesterol seems to run in our families. This book was helpful when I became aware of this health issue and my ability to control it to some extent and lose weight by making healthier food choices. Good basics and simple ingredients form the basis of the Goors’ recipes and I appreciate the simple, clear directions. I haven’t looked into the newer editions but would recommend their books for those interested in a lifetime of health.